Edinburgh is the capital of Scotland and is nestled in the central belt region of the country between a collection of gorgeous historical villages and medieval relics. It’s filled with an ancient heritage that really is as old as the hills, as well as new architecture that has sprung up from the cracks, and is packed with plenty of culture, activities and parties to keep the wandering traveller settled for a few months. Edinburgh is renowned the world-over for its entertainment. Hogmanay is the biggest night of the year with street festivals, huge parties and on-going events but the rest of the year won’t disappoint. Expect to find cultural festivals and night-life parties that are scheduled throughout the year (come rain or snow) as well as many street performers that will entertain you during the day. Many restaurants and pubs come alive well before midday, and Edinburgh boasts a collection of fringe and mainstream clubs to satisfy any musical cravings. The party here doesn’t stop, and it’s worth sticking around to enjoy the family-friendly events as well. 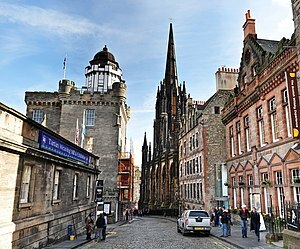 It goes without saying that you should visit the Royal Mile. It’s the stretch of roads that go from the Castle down to Holyrood House (both worth a visit, too) and it’s packed with charming little shops and houses as well as some big names like Starbucks. This is a great place to stay if you like being in the heart of the action and renting a flat is a great option for those who want to enjoy the sites of Edinburgh for a bit longer than a three-day weekend. The Royal Mile is typically geared towards tourists with shops toting tartan apparel and fudge but there are some lesser-known treasures as well. Pop into Mary King’s Close while you’re there and take part in a shriekingly disturbing ghost tour for famous Scottish scares and hauntings. Other important sights include the Rosslyn Chapel (of ‘The Da Vinci Code’ fame), Arthur’s Seat (excellent views on top of an extinct volcano) and the Camera Obscura (which affords a 360’ view of the city!). Scotland is famous for a number of things, but none less important than its black pudding, deep-friend desserts and ‘bangers & mash’. Monster Mash is a tiny little bistro restaurant that offers up a multitude of mash and banger combinations (swede mash is particularly good), and you can get deep-fried desserts at speciality restaurants in the centre of town. Keep a look-out for their popular vodka burgers, and be ready to drink everything down with a generous helping of Scottish Whisky. Renting a flat in Edinburgh doesn’t have to be a costly affair: flats and rental accommodation in New Town is affordable, if not cheap, and the closer you get to the bigger sites the more expensive things get. You might consider staying close to the action and renting a flat with friends as you’ll soak up more of the culture and nightlife, but it’s easy enough to walk the width or breadth of Edinburgh if you’re looking to save a few pennies. Nicolas is a travel writer and all round globetrotter originally from New York but is now specialized specifically on the United Kingdom but also Europe and the Mediterranean in general. He has traveled extensively throughout the UK, Scotland being his most recent stop where he spent for 4 months last year.